See, I would love to do one of these lists but I don't listen to enough bands that nobody has ever heard of so I couldn't impress anybody. Besides, nobody would want to read it anyways! Fun read so far though, TheFolkslave! Yeah seriously, my list would be like "9. Songs for the Deaf, 8. Deja Entendu, etc. ", but everyone here is a f*cking musical genius and they'd just be like "oh, ....yawn"
I imagine I too would write a ****e list. Some very well-written stuff here; I'll have to refer back to this once I'm in need of some recc's. How long have you been listening to music (ie really passionate about it)? Seems you've picked up quite a background. I started to listen to music passionately in my early teens (13 maybe??). Before that I had been listening to music but wasn't that obsessed with it and basically listened to what was on the radio or what my friends were listening to. Im now 21 and although Im young (or atleast consider myself to be young) I have listened to quite alot of music. I used to like metal alot when I was a teenager but soon my musical tastes started to widen and I began to like different kinds of music. The past few years I have been listening to alot of indie, post-rock, more ambient stuff and also some metal. I really hope that people like reading this and maybe even find something new. I have quite a few bands up my sleeve that aren't that well known since many of them are small bands from Finland and Sweden. **** it. I say we make our lists! Yeah, I think Weiland is the one to start with. It's their strongest work in my opinnion. After that Where at Night the Wood Grouse Plays would be good before listening to the first two albums which are metal albums (the metal albums are good too but not as good as the neo-folk albums). Im really stoked about Empyriums comeback since I listened to them alot as a teenager and I also liked the new song alot. Two Gallants is a indie/folk rock duo from San Francisco, California. Two Gallants is made up of Adam Stephens (vocals, guitar, harmonica) and Tyson Vogel (drums, vocals). The two started to play together at the age of twelve. They started to play local gigs around San Fransisco in 2002. They recorded self released CDs and played gigs in street corners, warehouses and house shows. After releasing their first full length album they started to play club shows also. 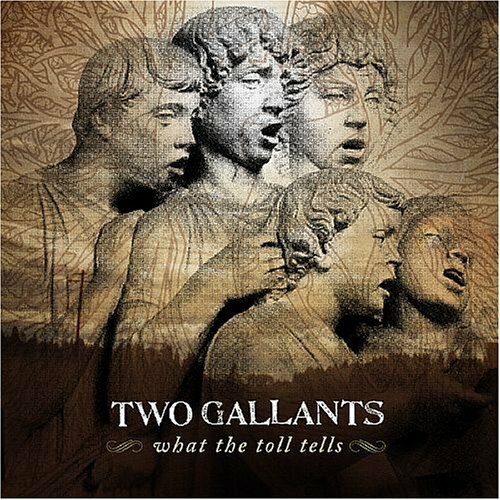 What the Toll Tells is the second album recorded by Two Gallants in 2006. The album got favorable reviews but also raised controversy because of the song Long Summer Day because of use of the word "******" in the songs lyrics. The song describes a black man dealing with the oppression of a white boss (both Adam Stephens and Tyson Vogel are white). Critics said that the band were borrowing otherness in writing the song. The band reacte by saying that they didn't know that they weren't allowed to "write about our country's embarrassing past" and that they are required to write about "the trials of two pale skinned urbanites who have never known a day of struggle in their lives". I can't remember how I heard about this band but I've been listening to them for many years now and I got almost all of my friend to like them too. This album is very dear to me. Im in love with Adam Stephens lyrics, voice and the amazing finger picking style he plays. Tyson Vogels drum playing is really awesome too. I usually don't care about lyrics that much but Two Gallants is an exception since their lyrics are awesome. I enjoy all their albums but What the Toll Tells is their best in my opinion. Last edited by TheFolkslave; 11-09-2010 at 07:32 AM.